The physico-chemical properties of chlorophylls b and c have been known for decades. Yet the mechanisms by which these secondary chlorophylls support assembly and accumulation of light-harvesting complexes in vivo have not been resolved. Biosynthetic modifications that introduce electronegative groups on the periphery of the chlorophyll molecule withdraw electrons from the pyrrole nitrogens and thus reduce their basicity. Consequently, the tendency of the central Mg to form coordination bonds with electron pairs in exogenous ligands, a reflection of its Lewis acid properties, is increased. Our hypothesis states that the stronger coordination bonds between the Mg atom in chlorophyll b and chlorophyll c and amino acid sidechain ligands in chlorophyll a/b- and a/c-binding apoproteins, respectively, enhance their import into the chloroplast and assembly of light-harvesting complexes. Several apoproteins of light-harvesting complexes, in particular, the major protein Lhcb1, are not detectable in leaves of chlorophyll b-less plants. A direct test of the hypothesis – with positive selection – is expression, in mutant plants that synthesize only chlorophyll a, of forms of Lhcb1 in which weak ligands are replaced with stronger Lewis bases. The mechanistic explanation for the effects of deficiencies in chlorophyll b or c points to the need for further research on manipulation of coordination bonds between these chlorophylls and chlorophyll-binding proteins. Understanding these interactions will possibly lead to engineering plants to expand their light-harvesting antenna and ultimately their productivity. In plants and algae, the reaction centers of photosystem I and II are enclosed within core complexes that contain a precisely defined set of proteins – essentially all encoded in the chloroplast genome. The primary cofactor for the photochemical reactions in these complexes, chlorophyll (Chl) a, is also required for assembly of these complexes. The end-product of the Chl biosynthetic pathway in plants in the dark, protochlorophyllide (Pchlide), is unable to support the assembly processes, which suggests that the light-dependent reduction of the double bond between C17 and C18 of Pchlide (see legend to Fig. 1) has a profound effect on the properties of the molecule. Plants and green algae (Chlorophyta) contain in addition Chl b, an accessory Chl found only in peripheral light-harvesting complexes (LHCs). These complexes usually contain three xanthophyll molecules, two luteins and one neoxanthin, and nearly equal amounts of Chl a and Chl b (7 or 8 Chl a and 5 or 6 Chl b molecules for the major LHCII, with an a/b ratio of 1.4) bound to proteins (LHCPs) that are encoded in the nuclear genome and imported into the plastid after synthesis in the cytosol. Chl b-less mutant plants are deficient in Chl and, although containing fully functional reaction centers, have a relatively low photosynthetic capacity and greater sensitivity to high-intensity light because of a deficiency in LHCs . 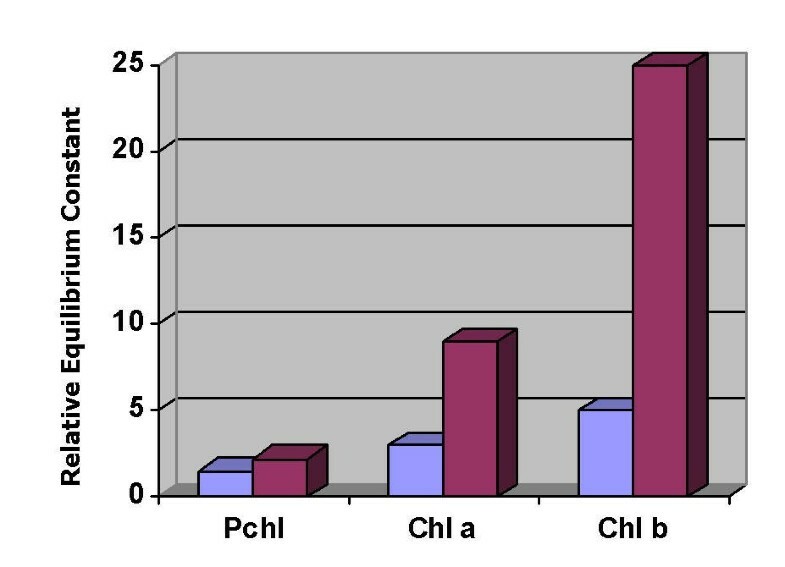 Algal species in the family Chromophyta contain Chl c (Fig. 1) instead of Chl b, which is also restricted to LHCs and seems to serve the same function in these organisms that Chl b provides in the green plants . A large volume of data exists in the literature on these Chl derivatives. In this article we propose a mechanism for the important auxiliary roles these Chls play in photosynthesis. Structures of Chls. (a) Stereochemistry and numbering system in monovinyl-Chl a. Variations of Chl include (b) Chl b (7-formyl, R = phytyl); and (c) Chl c1 (171-dehydro-Pchlide, R1 = methyl; R2 = ethyl or vinyl; R = H). Pchlide is similar to Chl but contains a saturated propionic rather than acrylic acid group on C17. (Structures as in ). Etioplasts, the form of the plastid that develops in dark-grown plants, were unable to insert LHCPs into membranes unless Chl was added . 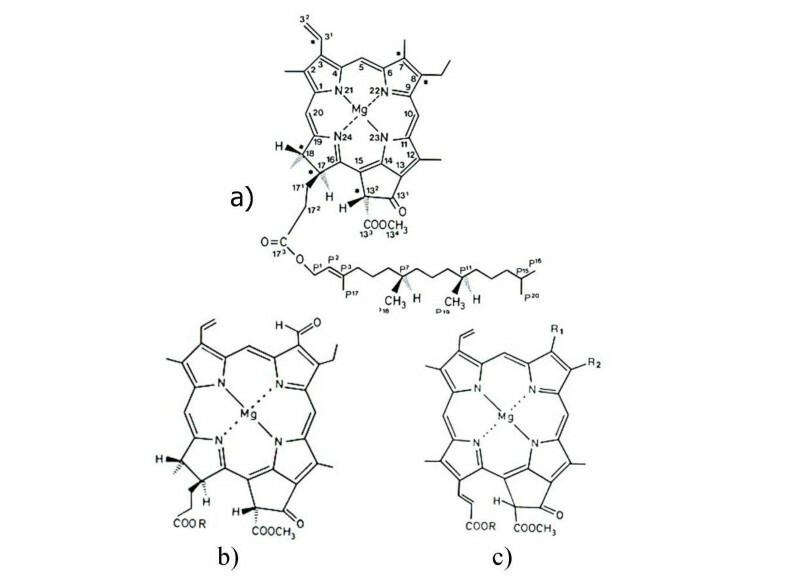 In these experiments, in which the Zn derivatives were used because of their increased chemical stability over the Mg-containing molecules, Zn-pheophytin b was more effective in insertion than Zn-pheophytin a. An important role of Chl b was further revealed by experiments in which newly synthesized LHCPs were detected by pulse-labeling in Chl b-less mutant plants but the proteins were not recovered in chloroplasts isolated from these plants . These Chl b-less plants did not accumulate several of the LHCPs, in particular Lhcb1, Lhcb6 and Lhca4 . Chl b was not detected in plants exposed to intermittent light (cycles of 2 min of light and 98 min of darkness), which accumulated only small amounts of Chl a and thylakoid membranes [6, 7]. Wild-type plants treated in this way accumulated only one LHCP (Lhcb5), while Chl b-less mutants exposed to intermittent light lacked all LHCPs . In complementary fashion, Chl b did not accumulate when synthesis of LHCPs was inhibited . When bean plants exposed to intermittent light were treated with chloramphenicol to inhibit synthesis of proteins on chloroplast ribosomes, Chl b and LHCPs accumulated in parallel with no increase in synthesis of total Chl . These results indicate that photosystem I and II core complex proteins, which are synthesized in the chloroplast, compete effectively with LHCP for small amounts of Chl a made under these conditions, and that Chl b does not accumulate until sufficient Chl a is made to satisfy core complexes. Experiments with the model alga Chlamydomonas reinhardtii showed that LHCPs were not detectably imported into the chloroplast in the absence of Chl synthesis and instead accumulated outside of the chloroplast in the cytosol and in vacuoles . High concentrations of chloramphenicol caused strong suppression of total Chl synthesis when dark-grown algal cells were exposed to light, possibly by inhibition of Mg-chelatase  in addition to chloroplast protein synthesis. Synthesis of LHCPs on cytoplasmic ribosomes was not inhibited by chloramphenicol, and the proteins accumulated to the same level as in untreated cells [14, 15]. However, because of the low rate of Chl synthesis, only a small fraction of the proteins were imported into the chloroplast and remained at the initial site of integration. As illustrated in Fig. 2b, immunoelectron microscopy detected LHCPs along the chloroplast envelope. LHCPs were not detected in the interior of the chloroplast, although cell fractionation recovered a substantial amount in a soluble form . In control cells, the amount of Chl and thylakoid membranes increased rapidly when cells were illuminated, and LHCPs were detected in thylakoid membranes throughout the chloroplast (Fig. 2a). This result, obtained with cells incubated at 25°C, was consistent with localization of LHCPs on envelope membranes in cells immediately after initiation of thylakoid biogenesis at 38°C . At the higher temperature, not all the newly synthesized LHCPs were incorporated into envelope membranes, and the excess accumulated in cytosolic vacuoles [16, 17]. This evidence for the envelope as the site of initial interaction of LHCPs with Chl was also supported by proliferation of envelope-derived vesicles in dark-grown Chlamydomonas cells exposed to only a few minutes of light  and the lack of thylakoids in a mutant of Arabidopsis deficient in a protein apparently required for formation of vesicles from the inner membrane of the envelope . 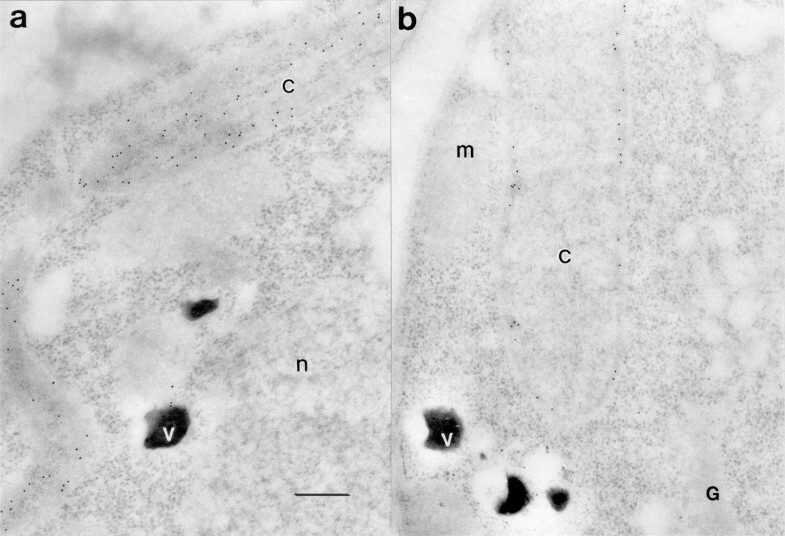 Immunoelectron microscopic localization of LHCPs in dark-grown cells of C. reinhardtii exposed to light for 6 h at 25°C (a) without or (b) in the presence of 200 μg chloramphenicol ml-1. The experimental conditions were described previously . Bound antibodies were detected with protein A conjugated to 10-nm gold particles . c, chloroplast; G, Golgi; m, mitochondrion; n, nucleus; v, vacuoles. The bar = 0.5 μm. These experiments with in vivo systems demonstrated that Chl b provides a function in LHC assembly that is not served by Chl a. Association of Chl with proteins occurs through coordination bonds between the Mg of Chl, as the Lewis acid, and amino acid sidechains as Lewis bases. The availability of an unshared pair of electrons in the Lewis base (the ligand) varies widely and is the primary factor in the strength of the coordination bond. The chemical properties of the central Mg in Chl also influence the strength of the resulting coordination bond. Biosynthetic modifications to the periphery of the tetrapyrrole ring progressively cause withdrawal of electrons from the pyrrole nitrogens, thereby decreasing their basicity [20, 21]. For example, oxidation of the 7-methyl group in Chl a to the electronegative aldehyde of Chl b reduces the pK of the pyrrole nitrogens by 2 pH units. Similarly, oxidation of the propionyl sidechain on Pchlide to the acrylate group in Chl c brings its electronegative carboxyl group into conjugation with the π system of the macrocycle, with the same effect . As a consequence, the central Mg atom of Chls b and c has a greater affinity for exogenous electrons, thus is a stronger Lewis acid. These considerations point to the possibility that proteins form stronger coordination bonds with Chls b and c than with Chl a, which may be particularly critical with ligands that are weak Lewis bases. The lack of an aldehyde group on the periphery of the macrocycle of Chl c, which replaces Chl b in homologous complexes in chromophytic algae, indicates that the primary interaction between Chls and the proteins does not involve such substituents. Whether phytylation of Chl is important for binding to proteins is not clear, because Chl c is incorporated into Chl a/c-protein complexes without esterification. Tamiaki et al. demonstrated that introduction of an oxygen atom to the periphery of a Zn-tetrapyrrole macrocycle, as occurs in the conversion of Chl a to Chl b, increased about two-fold the equilibrium constant for formation of the coordination complex with pyridine in benzene. Consistent with this observation, studies of detergent-induced dissociation of LHCs suggested that Chl b is held by the proteins approximately two-times more tightly than Chl a. Tighter binding of Chl b is apparently responsible for the well-known stability of light-harvesting complexes during mildly denaturing gel electrophoresis. The initial accumulation of LHCPs in the chloroplast envelope implies that Chl interacts with these proteins, likely by binding to the conserved motif in the first membrane-spanning region (helix-1) [25, 26] when transit through the envelope is initiated. Molecular modeling suggested that this 'retention' motif – ExxHxR in the first and ExxNxR in the third membrane-spanning region – within all LHCPs and related proteins provides two ligands for Chl, an ion-pair between Glu (E) and Arg (R) and the sidechain of either His (H) or Asn (N). Binding of Chl a to a 16-mer synthetic peptide was reduced by one-half when His within the motif sequence was replaced with Ala . Replacement in addition of the Glu or Arg with Ala eliminated binding to the synthetic peptide. Import of a mutant LHCP into isolated chloroplasts was nearly abolished when His within the motif was substituted with Ala . Association of Chl with this motif, therefore, appears essential for continuation of the proteins on the pathway of assembly of an LHC. An illustration of the effect of binding two molecules of Chl with enhanced affinity to a retention motif is shown in Fig. 3. Assuming a relative equilibrium constant of 3.0 for Chl a and 5.0 for Chl b binding to a ligand in LHCP (numerals approximated from data obtained by Tamiaki et al. ), the increase in affinity of Chl b with the protein leads to a nearly three-fold increase in stability of the complex over that with Chl a when two molecules are bound. This conclusion is derived from the equations: R + Chl ↔ R·Chl; R·Chl + Chl↔ R·Chl2; R + 2Chl ↔ R·Chl2; Keq = [R·Chl2]/ [R] [Chl]2. The additional molecules of Chl b in LHCII would further enhance this effect by shifting the equilibria toward complex formation. Graphical illustration of the relative equilibrium constants for complexes of Chl with retention motifs when one (blue) or two (magenta) molecules of Pchlide, Chl a or Chl b are bound. The most electronegative ligand in LHCPs is the sidechain of His. Less strong Lewis bases are the charge-compensated Glu in an ion-pair with Arg, the amide group of Gln and Asn, and finally the carbonyl of the peptide backbone as the weakest . The importance of the ligand was demonstrated by substitution of His with the weaker Lewis base Asn in the apoprotein of the bacterial light-harvesting complex LH1, which eliminated assembly of the complex in vivo and reconstitution in vitro. Formation of a stable coordination bond with a weaker Lewis base is expected to require a stronger Lewis acid. Consistent with this prediction, a position in CP29, a minor LHCII, was preferentially filled during reconstitution by Chl a when the amino acid residue was the normal Glu, in an ion-pair with a bound Ca++ ion, but occupancy was shifted toward Chl b when the ligand was a weaker base, the amide group of Gln . Although the on-rate for Chl b may be slower than that for Chl a, because binding may be impeded by a water molecule more strongly coordinated to the central Mg atom of Chl b, the greater Lewis acid strength of Chl b allows more stable bonds with the weaker ligands. Our hypothesis on the biological role of Chl b should be reflected in the binding sites of Chl in LHCII. Resolution of the structure of native LHCII at 3.4 Å  revealed locations of individual Chls but did not provide identification of the Chl in each site or whether any site in the complex has mixed occupancy. 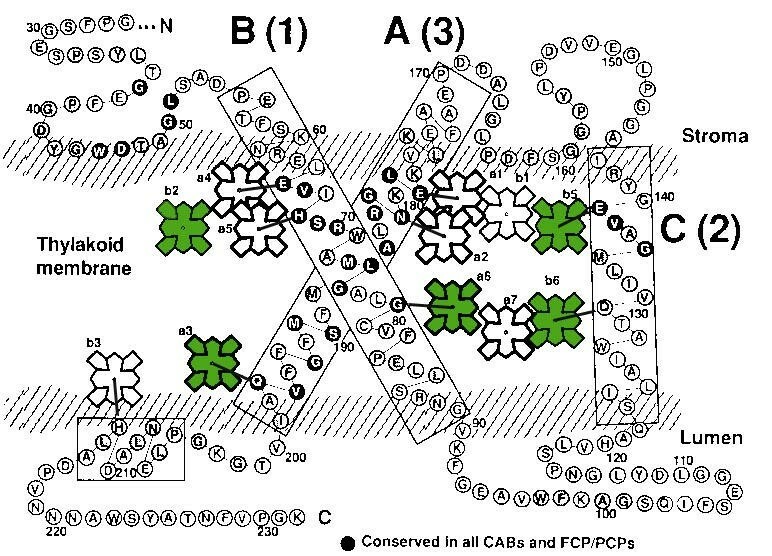 The model developed from this work suggested that binding sites in the core of the complex, near the central lutein molecules, were occupied by Chl a, whereas Chl b was more peripheral. From measurements of ultrafast energy transfer kinetics within native LHCII, Gradinaru et al. suggested that indeed lutein transferred excitation energy entirely to Chl a while neoxanthin, a xanthophyll bound near helix-2 (see Fig. 4), transferred energy to Chl b. With similar techniques, however, Croce et al. presented evidence for detectable transfer of energy from lutein to Chl b, which suggested close contact of Chl b molecules with the central luteins. Several groups developed a more direct approach for determining occupancy by analyzing effects on the composition of the final complex, after in vitro reconstitution, when amino acid residues in LHCPs were replaced with substitutes that are unable to serve as a ligand. For example, steric hindrance caused by substitution of bulky Phe for Gly78 (residue numbers are given with reference to Lhcbl) in the position designated a6  prevented this peptide carbonyl, non-H-bonded because of Pro82 one helical turn further, from serving as a ligand (see Fig. 4). This change resulted in loss of one Chl b after reconstitution . Gln 131 (b6) and Glu 139 (in an ion-pair with Arg142) (b5) were also identified as ligands to Chl b[31, 34–36]. Remelli et al. found that substitution of ligand Gln197 (a3) or His212 (b3) with Leu or Val, respectively, led to sub-integral loss of Chl a and Chl b, which indicated mixed occupancy in each site. Studies by Rogl and Kühlbrandt , on the other hand, suggested that both sites were filled with Chl a. Assignments after in vitro reconstitution may have a degree of uncertainty, because the composition of the final complex varies as a function of the Chl a:b ratio in the reconstitution mixture . Mixed sites, even when Chl a was present in excess in the mixture , probably reflected a preference for binding of Chl b to the protein. Based on ligand strength, and the likelihood that occupancy is unambiguous in vivo, His212 may serve as a ligand for Chl a and Gln197 for Chl b. Model of the association of Chl with Lhcb1. The arrangement of the protein in thylakoid membranes is illustrated according to ref. 50. The "core" Chls (a1, a2, a4 and a5) are shown as Chl a according to ref. . The green color marks positions of Chl b as proposed in the text. Sites a3 and b3, although mixed in occupancy after reconstitution , were assigned as shown based on ligand strength. At least four of the five Chl b molecules are coordinated directly to the protein. The biological requirement of Chl b for accumulation of Lhcb1 (see text) suggests an alternate assignment for a4, as also proposed in ref. .
Mutation of Glu65 (a4) or Asn183 (a2) each resulted in loss of one Chl a and one Chl b. Rogl and Kühlbrandt  suggested that Glu65 (in an ion-pair with Arg185) may be a ligand for Chl b, with another site, occupied by Chl a, affected by loss of the protein-bound Chl. Chl b in site a4 would be consistent with the biological necessity of association of Chl b with helix-1 for retention of the protein in the chloroplast. However, based on similarity to results from reconstitution of the more simple CP29 (Lhcb4) , Remelli et al. suggested that Glu65 (a4) and Asn183 (a2) are occupied by Chl a. Loss of the latter Chl apparently resulted in loss of 'out-lying' Chl b in site b2, which is near a2 in the 3-dimensional structure. These assignments thus account for the five Chl b molecules in the complex (Fig. 4). Site b1 must consequently be filled with a Chl a molecule . The orientation of the transition moments of Chl b in sites b5 and b6  suggest that an 'out-lying' Chl a molecule could coordinate with the formyl group of Chl b, a sterically more favorable arrangement than coordination to the 131-carbonyl oxygen because of the opposing orientations of the 132-carboxymethyl and 17-propionyl group (Fig. 1). Although coordination of an 'out-lying' Chl to a protein-bound Chl would enhance Lewis acid strength of the latter, the distances between Chls [29, 35] suggest that interaction would require mediation by water molecules. Alternatively, these Chls may coordinate with peptide carbonyl groups. Site a6, considered to be filled with Chl b[34, 38], may play a role in retention of LHCPs in the chloroplast. Lhcb6, a minor LHCP, contains Gly instead of Pro at the position analogous to 82 in Lhcb1, thus eliminating the peptide bond carbonyl of Gly as a ligand, but Lhcb6 has a potential ligand for Chl b in Gln83 [39, 40]. These two LHCP sub-species, along with Lhca4 are most affected by the lack of Chl b in vivo. Lhcb4 (apoprotein of CP29) has Val instead of Pro at 'position 82', and the absence of site a6 in Lhcb4 may contribute to its drastic reduction in Chl b-less mutants [5, 8]. However, Lhcb2, Lhcb3, Lhca1, Lhca2 and Lhca3 contain the Gly peptide carbonyl as a ligand (each has Pro at 'position 82' ) but are reduced only slightly, if any, in amount by the lack of Chl b. Site a6 may therefore not be essential to accumulation of the protein but serve in concert with initial involvement of Chl b, directly or indirectly, with the completely conserved retention motif. Because interactions that develop during import may be altered as the result of conformational changes as the complex assembles, in particular, as the retention motif loop  is stretched into a helical structure, the final occupancy in each site in the final complex may not reflect the initial associations. Understanding the constraints on assembly of the complex in vivo – including retraction into the cytosol when the amount of Chl is insufficient  – and the order in which Chls are bound, will require new experimental design. We expect that synthesis of Chl b by Chl(ide) a oxidase  will be determined by the local environment around specific Chl a molecules, created by the assembly process. It is interesting to note that the retention motif in all LHCs that contain Chl b is followed by a Trp residue, which may be involved in synthesis of Chl b. A converse mutagenesis approach would provide a rigorous test of the hypothesis. A stable complex should be achieved with only Chl a, in a Chl b-less plant or by in vitro reconstitution, when weak ligands in LHCPs are replaced with stronger Lewis bases. Increased strength of the engineered coordination bonds with Chl a should compensate for the lack of Chl b. In particular, a stable complex should accumulate after Gln131, Glu139, Asn183 and Gln197 in Lhcb1 are replaced with His. A stronger ligand could also be introduced in the position of Gly78, which seems to be the weakest ligand in the complex. Substitution of these amino acids in the sequence of Lhcb1, a major LHCP that can not be detected in Chl b-less plants [5, 8], would be expected to restore accumulation of the protein with only Chl a. This experiment provides a positive in vivo selection for validation of the hypothesis, in contrast to the dramatic decrease in accumulation of the proteins when ligands are removed by substitution with non-ligand amino acids . Furthermore, whereas stable complexes can be achieved by reconstitution with wild-type Lhcb1 and only Chl b but not only Chl a[37, 43], the hypothesis predicts that stable complexes can be reconstituted with the mutant protein containing these substitutions and Chl a. An extensive amount of evidence in the literature supports the hypothesis presented in this article on the role of Chl b. It should be noted, however, that several LHCPs accumulate in chloroplasts in the absence of Chl b[5, 8], perhaps because they integrate more easily into membranes, which implies that other features of the proteins are involved. The work already done has established that several LHCPs are imported into the chloroplast at a substantial rate only when sufficient Chl b is available and they accumulate initially in the envelope membrane. Results from in vivo experiments have shown that interaction of Chl b with the first membrane-spanning region, including the retention motif, is critical for progression of import of these proteins. The initial steps in assembly also require the abundant xanthophyll lutein , which has not been the focus of this article. The availability of Chl b thus strongly regulates import of LHCPs as well as assembly and eventual accumulation of light-harvesting complexes. The resulting dramatic enhancement in the efficiency of light capture for photosynthesis apparently provided a strong evolutionary pressure for development of the ability of photosynthetic organisms to synthesize Chl b or Chl c.
The structure of LHCs has been extensively studied and linkage of the complexes to reaction centers, physically and functionally, is well understood. Further understanding of LHC assembly requires a better knowledge of the characteristics of the reaction catalyzed by Chl(ide) a oxidase and whether Chl b is restricted to these complexes because LHCP serves as a specific effector of the oxidation of Chl(ide) a or whether the protein simply provides binding sites for Chl b and prevents its conversion back to Chl a. The latter appears less likely as a specific effect, because similar ligands should occur in other proteins. In particular, the early-light induced proteins are homologous to LHCPs but bind little if any Chl b. The mechanism of Chl b synthesis, an oxidation of the methyl group at position 7 , will be an area of active research in the future, now that the gene for Chl(ide) a oxidase has been identified [47, 48]. Moreover, it is not known whether a pool of free Chl b exists in a local environment in chloroplast membranes that is mimicked by the amount of Chl b in reconstitution experiments. Attempts to understand assembly of the complex in vivo will provide ample opportunity for additional experimental work. apoproteins of LHCs associated with photosystem II or I, respectively. L.L.E was supported by Graduate Training Grant DGE9553456 from the National Science Foundation. This is publication number 498 from the Center for the Study of Early Events in Photosynthesis at Arizona State University.